October 15, 2010 – Winnipeg, Manitoba-With the XXIII Triennial Congress of Ukrainian Canadians just 3 weeks away, organizers are working on final details for this important weekend of discussion and decision making. Registrations have been growing steadily and Ukrainian Canadians are encouraged to take part. Among the many keynote speakers and session presenters will be former Ukrainian Ambassador to Canada Dr. Yurij Scherbak, former Canadian Ambassador to Ukraine Derek Fraser, and former chief archivist for the Ukrainian Security Service Volodymyr Viatrovych. Some of the various discussions to take place include topics on language retention, Holodomor awareness, and engaging Ukraine, among others. “With the event just a few weeks away, we want to remind everyone to submit their registrations to ensure that we can accommodate you at all the activities of Congress XXIII,” stated Daria Luciw, Congress Chair. Online registration is still open for the November 5-7, 2010 Congress taking place in Edmonton, Alberta. If you are still planning to attend, organizers wish to remind you that registration is available online by going to Congress XXIII. 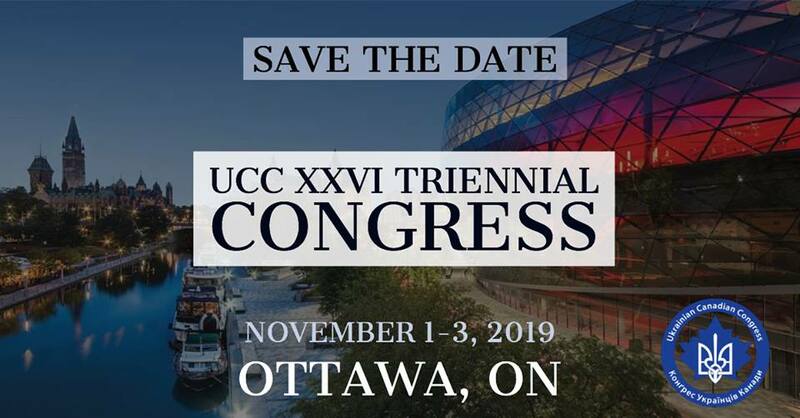 As the Congress also includes events open to single ticket purchase, such as the UCC 70th Anniversary and Shevchenko Medal presentation banquet, it is important to secure your attendance by registering quickly. In addition, special hotel rates are available at the Westin Hotel in Edmonton until October 18, 2010 and at the Crowne Plaza until October 21. After those dates room availability and rates will change significantly during the busy conference season in Edmonton. Information for hotels can also be found on the website. The organizing committee and Congress Coordinator Slavka Shulakewych also remind UCC members and community organizations of the opportunity to have an exhibit at the Congress. A display area has been organized to profile your work in our active community. Contact 780-919-5934 if you would like to be a part of the exhibit area. Edmonton and Alberta look forward to welcoming everyone to Congress XXIII as we ‘Honour the Past and Inspire the Future’.